Participating in game jams is a big challenge. You spend a full weekend working as hard as you can to make a complete game. When I was 16 years old, I was just beginning to learn programming games, but I really wanted to participate in a game jam to test out my skills. I had seen people participate in the Ludum Dare jam before, but had yet to do it myself, so I set out to participate in the Ludum Dare 30. For this jam, I decided I’d team up with my good friend, a very talented artist named Devon. He and I had never worked on a project together and were both nervous to see how it would go. August 22nd, 2014, the Ludum Dare 30 announced the theme “Connected Worlds” and we set off to create our game! We spent a while settling on an idea for the game and decided it would be pretty fun to interpret the theme quite literally. Our idea was a space shoot ’em up in which you’re hired to clear the ways between planets so that humans can build a giant space bridge between the planets! 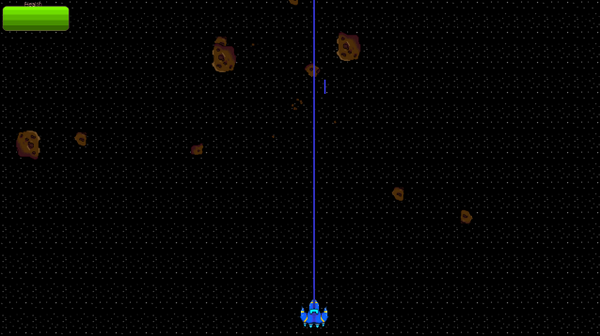 I quickly began building the shoot ‘em up mechanics in GameMaker while Devon worked on drawing out the player’s ship. I was very inexperienced, so it took much longer than I expected to created the basic parts of the game. I built out mechanics of moving and shooting as well as the space junk floating around, all while Devon drew all the necessary assets. I then took some time off programming to write some music for the game. I was also very inexperienced in that, so the music in the game ended up being quite repetitive and hard to listen to. During day 2 we continued work, but quickly realized we weren’t going to be able to do as much as we thought and changed our plans for extra levels. To help make the game a little better, we decided on a boss fight. I had never created a boss before, so it was definitely a big challenge to me, but it’s one that I often look back on and even refer to when working on new projects! After all that was said and done, we had created our first game: Intersolar Super Spaceway (Excellent!). In under 72 hours, we went from nothing, to a full on game! Looking back on it, I can see that the game is very rough and isn’t as good as I wanted it to be, but that’s what game jams are for! I got so much programming experience and game development experience in such a short amount of time and it’s given me something that I can always look back on and see how far I’ve come. Devon and I went on to participate in 3 more Ludum Dare competitions after that and continued to improve our process to create bigger and better games. Every single jam has helped me learn something new and I am definitely happy that I chose to participate in them. If you’re an aspiring developer, programmer, artist, or designer for games, I would highly recommend you participate in game jams as well. The experience they provide is invaluable and the projects you make will be worth the time you put into them! If you’re not sure when or where to participate, just check itch.io’s game jam calendar! The Global Game Jam is also coming up January 25-27, so if you have any interest in game development, I’d definitely suggest you join!